Two goals from loan signing Shayon Harrison got Melbourne City back to winning ways as they beat Sydney FC 2-0. The English forward, who arrived from Tottenham in January, netted twice after the break at Leichhardt Oval as City secured their first win over the Sky Blues in Sydney for four years. The victory lifted Warren Joyce's side to fifth on the ladder and ended a six-match winless run. City's win dented the minor premiership hopes of Steve Corica's team, who are now nine points behind leaders Perth Glory with five games to go. The match was played on a heavy pitch which had survived an inspection following a huge downpour. The conditions had more of an effect on the Sky Blues, given that they had made a midweek trip to Japan for an Asian Champions League game. They held out until the interval, with keeper Andrew Redmayne tipping Luke Brattan's low strike around the post from City's best chance. The visitors took the lead on 63 minutes when an interception from Kearyn Baccus launched a counter-attack. The midfielder broke forward before slipping the ball to Harrison on his right, and the 21-year-old tucked his shot under the diving Redmayne. Harrison's second came 15 minutes later when he was picked out at the far post by Harrison Delbridge's cross. His shot took a deflection off Paulo Retre to leave Redmayne rooted to the spot. City closed to within one point of fourth-placed Wellington Phoenix with what was their first away victory since mid-December. They have a seven-point cushion inside the Finals Series places, with just five rounds left. 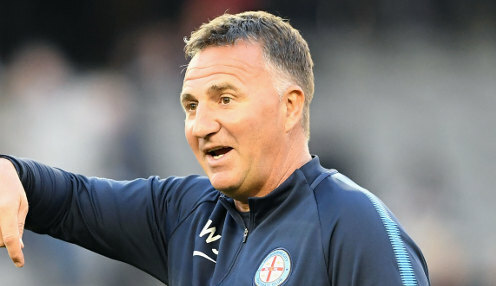 Melbourne City are 28/1 to win the Grand Final this season and 6/4 to win their next game against Western Sydney, who are 13/8 to emerge victorious, with the draw 5/2.